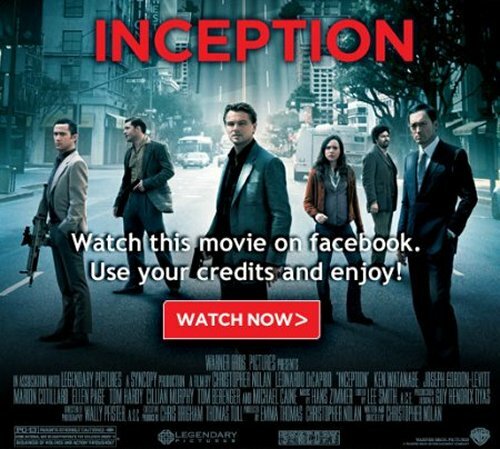 Facebook gets Inception and Harry potter for streaming. Remember back when I said Facebook was going to be renting movies with their creepy Facebook currency? Well they just announced the addition of “Inception,” “Harry Potter and the Sorcerer’s Stone,” “Life as We Know It,” and “Yogi Bear”…. bringing the total up to like 5 choices for your 48 hour viewing pleasure. This is still in the baby stage so we will just have to wait to see whether or not it works it fail. 28 Mar	This entry was written by CatastroFUCK and published on March 28, 2011 at 3:20 PM. It’s filed under Digital Wonderland, Movies and tagged conception, dont cross the streams!, facebook, movies, Warner Bros..	Bookmark the permalink. Follow any comments here with the RSS feed for this post.